Mother’s Day is just around the corner which means it’s almost time to start putting any plants you want to grow this year into the ground at your Indianapolis home. If you live in Indy it’s possible you don’t have much yard or any at all to plant in but its not necessary! Even the smallest patio or porch can boast a crop of vegetables or a garden of flowers in containers. Planter boxes, wooden barrels, hanging baskets, and flowerpots are a sampling of containers that are perfect for your patio or porch garden at your Indianapolis home. 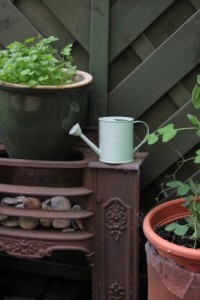 To get the most from your container gardening consider these guidelines for choosing a container. Wooden containers are susceptible to rot. Redwood and cedar are relatively rot resistant and can be used without staining or painting. The size and number of plants to be grown will determine the size of the container used. Deep rooted vegetables require deep pots so consider the size based on what you are planting. Make sure your pot has adequate drainage. Holes should be 1/2 inch across. Line the base of the pot with newspaper to prevent soil loss. If using quite large pots with short-rooted plants you may find that filling the bottom of the pot with shipping peanuts will be useful. It lightens the load of the pot and also helps with drainage. What should you grow in Indianapolis home‘s garden? The options are endless from annual flowers to vegetables and herbs. Some vegetables that work especially well in containers are lettuces, carrots, radishes, spring onions, and tomatoes. You can have a bevy of vegetables right outside your door. No need to go to the store to get a salad, just pop onto your balcony and snip some homegrown veggies. Better Homes and Gardens has information on planting guides, based on region, and container planter guides and plans, if you’d like to do some planning. We hope you are able to take advantage this spring and get a lovely container garden going outside your apartment or condo. Indianapolis is such a lovely city to enjoy in the summer, we cannot wait for the warmer weather to be here. If you are currently renting and are interested in buying your own Indianapolis home, please contact an Indianapolis real estate agent! We look forward to hearing from you soon!